The cosume is worn by me, I have a real zipper glued with spirit glue, down the middle of my face opening up around my mouth. White makeup was applied around the outer portion of my face and neck. 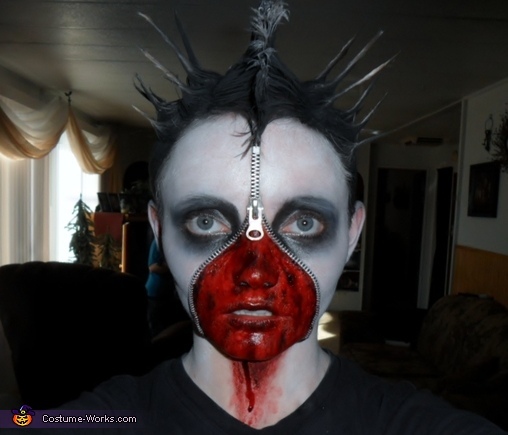 The eyes darkend with black makeup and fake blood and scab applied to the area inside the zipper around my mouth. The hair was spiked using knox gelatin and hair gel. Then sprayed black with black hair spray and a little bit of white on the top of the mohawk and the back of the head, then I cut out a stencil and held it to the back of my head and sprayed black hair spray to creat the eyes and mouth on the back of the head. This costume is freakin awesome! I have seen tons of zombies this year (Due to the growing popularity of the zombie culture) And I would have to honestly say, this is BETTER than most I have seen! Strikes some tones of Resident Evil. Do you still have this costume?